Saint Rose, dear to the Virgin Mary. Pray for us. Saint Rose, who disliked worldly vanity. Pray for us. Saint Rose, perfect example of an angelic life. Pray for us. Saint Rose, flower among the thorns. Pray for us. Saint Rose, example of patience and mortification. Pray for us. Saint Rose, victorious over temptation. Pray for us. Saint Rose, favored by appearances of the Blessed Virgin Mary. Pray for us. Saint Rose, devoted to heavenly contemplation. Pray for us. Saint Rose, full of God’s love. Pray for us.St. Rose, passionate for the salvation of souls. Pray for us. Saint Rose, whose charity was not stopped by persecution. Pray for us. Saint Rose, full of the love of Jesus and Mary. Pray for us. 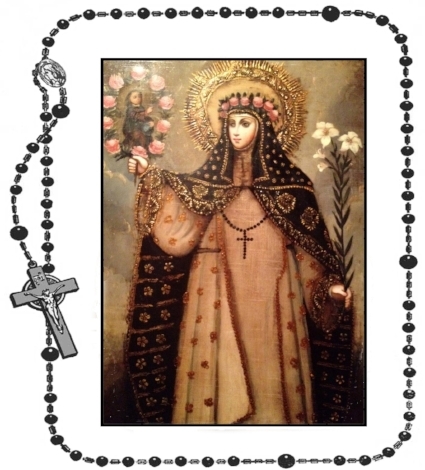 Saint Rose, first flower of sanctity in America. Pray for us. Saint Rose, sweet–scented rose of piety and virtue. Pray for us. Saint Rose, servant of God perfectly united with Him. Pray for us. Saint Rose, lover of prayer and solitude. Pray for us. Saint Rose, merciful friend of sinners. Pray for us. Saint Rose, consoler of the sick and help of the needy. Pray for us. Saint Rose, beloved by God. Pray for us. Pray for us, O holy Saint Rose, that we may be made worthy of the promises of Christ. Saint Rose, pray for us that we may one day glorify the Blessed Trinity in heaven. Obtain for us your lively faith that we may consider all people, things and events in the light of God. Pray, that we may be generous in making sacrifices of worldly things as you so wisely did. Please, also, pray for me and my intentions (State your intentions here). Most holy Saint Rose, set us on fire with love for Jesus, so that we may thirst for the sacraments and be excited to spread the word of His kingdom. By your powerful intercession, help me perform my duties to God, the world, and myself. Help me to be pure and to have a close relationship with Mary, Our Mother. Protect us today and every day and keep us free of sin. Please, also, pray for me and my intentions (State your intentions here). Saint Rose, you were a beautiful flower blooming on rocky soil. You were, indeed, a rose among thorns who displayed purity, meekness, modesty and patience as an example for us all. Help us to follow your example so that we may be more pleasing and acceptable in the sight of God. Please, also, pray for me and my intentions (State your intentions here). Saint Rose, when you head Jesus say to you, “Rose of My heart, you shall be My spouse!” your soul was flooded with love for Him. We also desire such a love. Please help us love Jesus as you did. Instill in our hearts a great desire to be united with Him. Pray that we may imitate Jesus’ example as you did. Please, also, pray for me and my intentions (State your intentions here). Saint Rose, please help us be patient in suffering, gentle under offenses, humble in misrepresentation, and always pure of heart and mind. Pray for us that we may be able to renounce malicious desires and persevere in prayer and good works that will please God. Please, also, pray for me and my intentions (State your intentions here). Saint Rose, win for us the virtue of purity and a great confidence in the Blessed Virgin Mary. Protect us today and every day of our lives. Keep us from mortal sin and obtain for us the grace of a happy death. Please, also, pray for me and my intentions (State your intentions here). Saint Rose, you knew how to love Jesus with a generous heart. You despised the world’s vanities in order to embrace His Cross. You loved our Heavenly Mother with unfailing devotion and you dedicated yourself serving the poor, serving them the same way Jesus did. Teach us to imitate your greatest virtues, so that we may follow your example and enjoy your glorious protection in Heaven. Please, also, pray for me and my intentions (State your intentions here). Saint Rose, you are the first flower of sanctity in the New World. Let the fragrance of your virtues diffuse itself into our lives. Grant that we may be able to imitate your holy purity. Please obtain for us courage in the practice of penance. Teach us, to love Christ Crucified and Mary His Mother. Please, also, pray for me and my intentions (State your intentions here). Saint Rose, fragrant rose in the garden of God, sweetly blooming amid the thorns of suffering, white as snow in the innocence of your heart, glowing in the love of God. Most grateful, most humble Saint Rose, have pity on me. Please pray for me and my intentions (State your intentions here). God our Father, Saint Rose gave everything to devote herself to You through her life of penance. By the help of her prayers we seek to imitate her selfless way of life so that we may enjoy the splendor of Heaven. Please grant this through our Lord Jesus Christ who live and reigns forever and ever. Amen. Saint Rose, pray for us!